Thanks to Mike Wood of the wonderful Web site MykoWeb (www.mykoweb.com) for sharing his gorgeous photo of Gyromitra californica in the fresh state; I have only studied decades-old herbarium specimens that fail to convey the beauty of the species. 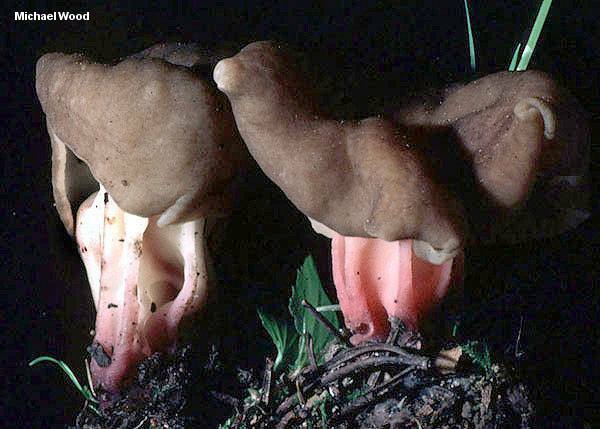 The terrestrial growth habit, cushion-shaped cap, and ribbed stem with a pink base distinguish Gyromitra californica from all other species of Gyromitra but Gyromitra sphaerospora, which is virtually identical but grows directly from wood most of the time, and features round (rather than ellipsoid) spores. Some mycologists place Gyromitra californica and Gyromitra sphaerospora in a separate genus, Pseudorhizina--but DNA studies (e.g. O'Donnell and collaborators, 1997) have not supported this idea; thus Pseudorhizina californica is a synonym. Ecology: Saprobic; growing alone, scattered, or gregariously under conifers--on the ground or rarely from well rotted conifer wood; late spring through summer; western North America. Cap: 2-20 cm across; 1.5-8 cm high; loosely convex, with a puffy and undulating appearance; rarely slightly 2-lobed and saddle-shaped; convoluted but not wrinkled; bald; tan to brown or olive brown or yellow brown; undersurface whitish, bald or finely dusted, ribbed. Stem: 3-12 cm high; 2-6 cm wide; widely and irregularly ribbed with sharp-edged ribs that extend onto the undersurface of the cap; whitish above, pinkish to purplish red or lavender below. Microscopic Features: Spores 13.5-20 x 7.5-11 µ; ellipsoid; with two small oil droplets; smooth. Asci 8-spored. 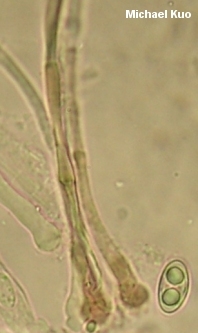 Paraphyses clavate to subcapitate; contents orangish to brownish; 6-8 µ wide. REFERENCES:(W. Phillips, 1879) Raitvir, 1965. (Saccardo, 1889; Harmaja, 1973; Smith, 1975; Smith, Smith & Weber, 1981; Arora, 1986; Abbott & Currah, 1997; Kuo, 2005; Miller & Miller, 2006; Trudell & Ammirati, 2009.) Herb. ILLS 44313 (AHS 47641). Herb. BPI 16922A.